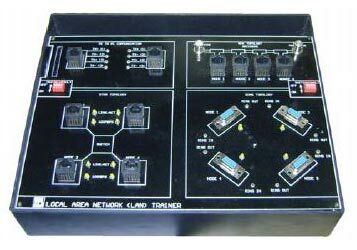 We are a chief Exporter and Supplier of Local Area Network Trainer. VPL's Local Area Network (LAN) Trainer provides the understanding of all the fundamentals of networking. It helps the user to gain knowledge regarding all network layers, cable designing and building of complete network of computers. The user can understand and implement various topologies using different standards given by IEEE. Connections can be made in different topologies and data can be transferred. The user will understand the protocols, topologies used in networking, measurement of error rate, throughput and effect of errors on protocols. The versatile software provided with VPL-LAN will assist the user to observe the various effects and configurations on network along with the graphical representation. Network Details : Indication of computer name, IP address, Port number, status of network, MAC address and OS on computer. Network & Protocol Analysis : Indication of packet serial number, file name, file size, file number, receiver name, Workgroup ,receiver IP address , total packets, packet length, time out, protocol, topology, receiver, MAC address, port number, file send start time, file sent completion time, transmission time data rate(Mbps), error.